Hard water is a problem that all Jacksonville residents face on a daily basis. These problems seem nominal at first but if left unchecked they will cause expensive plumbing problems down the road. 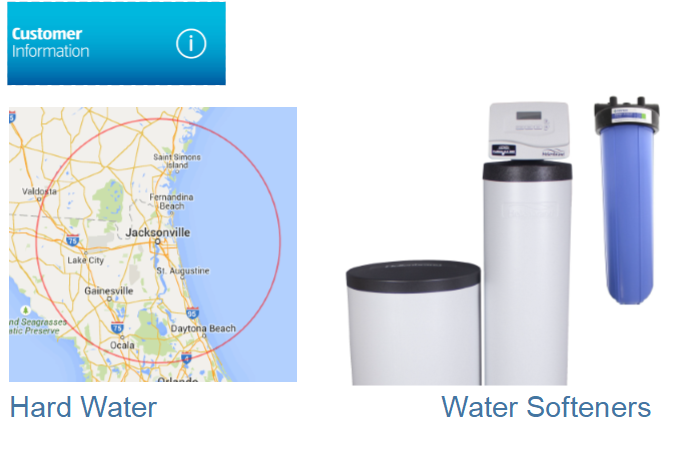 A water softener from Florida Water Technologies is an affordable solution to these hard water problems. In the next few paragraphs we will look at our hard water levels and how water softeners can fix this issue. Our source water comes deep down from the Floridian Aquifer. This aquifer contains an abundant supply of limestone which is comprised of calcium and magnesium minerals. These mineral dissolve into our water which is the water that is used to supply our homes. These dissolved minerals form limestone formations inside our plumbing system and white scale spots on our kitchen and bathroom surfaces. This continual flow of hard water minerals into our homes will build up and eventually cause problems in the water heater, dishwasher, faucet fixtures and more. Hard water is measured in grains per gallon. Which simply means how many grains of hard water minerals are contained in each gallon of water. 7-10.5 Grains per gallon is considered “Very Hard”. How Hard Is Jacksonville’s water supply? Our water supply contains higher levels of minerals than normal areas. We can have between 14 Grains Per Gallon to 28 Grains Per Gallon depending on where you live. This is 2 to 3 times more mineral content than the Water Quality Association considers “Very Hard”. Which means that our residents experience faster than usual plumbing and appliance damage than other areas with water containing lower mineral levels. Jacksonville Fl has water hardness levels that are the highest in all of Florida and considered to be severe by any measurement. Can a Water Softener Help this Problem? Yes. A water softener from Florida Water Technologies in an affordable, permanent solution to this excessive hard water problem that we face. These appliances remove the minerals before the water enters your plumbing system. Which fully protects and assures that damage and water spots/film do not occur.